Wow, we’ve just hit a new milestone — Apple has featured over 50 Buildbox Games! We also have had 52 different games break the Top 100, bringing the total to more than 100 features and chart topping hits. That’s more than all other game builders combined. Titles like Color Switch, Switchy Sides, Slip Away, Panic Drop, Sky, Bounce and many more were all Buildbox made. Currently Buildbox is averaging 3 features per month. However, what’s really interesting is the story behind the creation of these games, and how our customers without any prior coding knowledge have been able to crank out one hit after another. 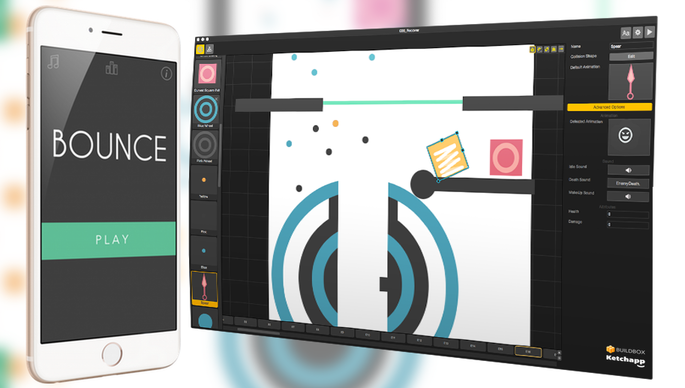 Bounce, which was released less than a year and half ago, was our first Apple feature game. It was created by a customer named Mike Davison and published by Ketchapp. With the advanced settings in Buildbox, it’s easy to quickly build out levels for rapid development and prototyping. Using the software it only took Mike 3 days to produce a working prototype of his game. He posted a video of his progress on our active forum. It happened to catch the attention of Buildbox founder, Trey Smith, who reached out to Davison to offer some helpful feedback. In only 7 days, after adding the suggested changes, Bounce was ready for release. Not only was the game featured by Apple but it also was ranked in the Top 25 US Charts for both iPhone and iPad. Color Switch, which was one of the biggest games this year, was also originally created in a single week using our software. “When I thought of the idea for Color Switch, 30 minutes later I had a demo in the software”, said David Reichelt, creator of Color Switch. Since its initial launch the game has amassed over 75,000,000 downloads worldwide. It also continues to hold its position in the Top charts. Our software was designed to not only be fast, but extremely easy to use. The advanced features and options in Buildbox allows anyone to easily make chart topping games. Buildbox is much more than just a software, we’re also a supportive community of game enthusiasts, designers, and entrepreneurs. Our forums are used as a sounding board for ideas, valuable feedback and tips. This milestone is just the beginning! We’re looking forward to seeing more of our customers’ games topping the charts in the months to come. You can check out all of the 50 + Buildbox Games that are making their mark on the charts in our All-Stars section. Whether it will consider the Chinese version? Same game, same graphics. Why is one on the top of the charts and the other doesn’t have a single review? I hope the one of the top of the charts is the original, otherwise someone just bought the one on bbriver and posted it with a different name. Great for them but I’m just wondering why one gets ranked and the same game by someone else doesn’t go anywhere. Proud of buildbox and being able to see my designs become games! Cant wait to keep trying to get that feature game! I myself have played many of the games that got featured by Apple. Also, I just downloaded the trial version of BuildBox. Any tips for me for building my first game? I want to know the current version of color Switch is made with Buildbox ? Hi Rencheeraj, Color Switch hit #1 in the app store when it was made with Buildbox, but they have since partnered with a development house to custom code the game.